Blackwater River as it's named after the river that runs through the pond. Stocking wise it's dominated by silvers, roach, tench, bream, perch and the odd crucian carp together with their larger cousins of carp to 10lb. 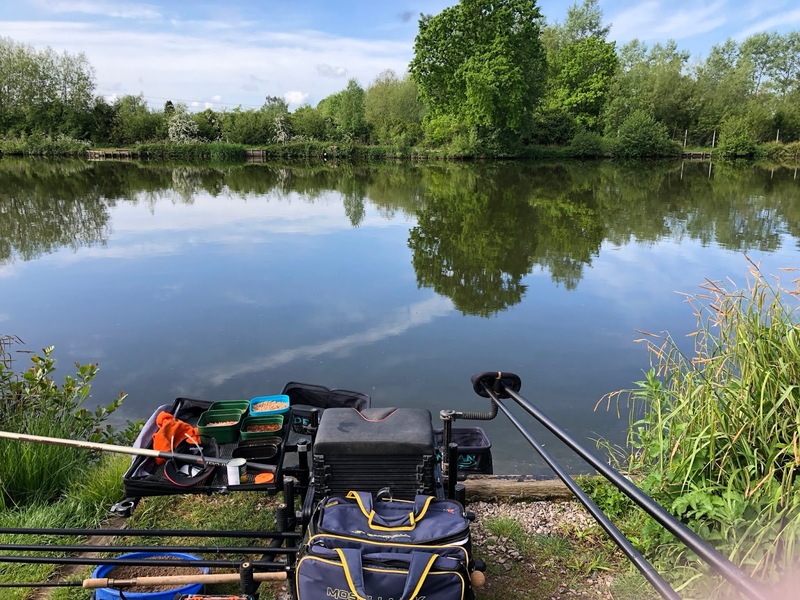 The far bank is where we would be drawing pegs for with plenty of space between the anglers as the pegs in the bag went from 26 through to 40. The banter at the draw was that the lower pegs would be where the bream. My home for the day would turn out to be peg 38. 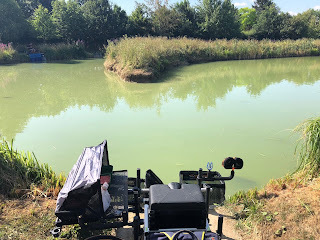 I spent around 10 minutes with the bomb rod checking the depth on what would be the feeder line and opted for an area at around 25 metres where I found some gravel although the overall depth of the lake is pretty shallow at around 4 feet. The bait menu consisted of maggots, caster, sweetcorn, micro, 6mm and expander pellet. Groundbait a 50/50 mix of method and F1 dark. 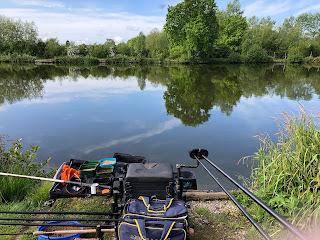 Being new to the venue my thinking was a mix of positive and negative swims, so the right hand pole line received an initial 4 balls of groundbait laced with casters while the left hand pole line had a single ball of micro pellets. Resting these swims saw me on the feeder for the first 90 minutes of the match, the first 30 minutes I was casting every 2-3 minutes with a 5 hole cage feeder in order to get some bait out on that line with double dead red maggot on the hook. It took around 30 minutes for the first bite to register which rattled the tip, the tell tail sign of a roach bite which graced the net soon after. Switching to a smaller 3 hole cage feeder I spent the next hour on the feeder with bites ranging from a wrap around which produced a lovely hybrid to a gentle pull from a lovely sized perch. Bites did slow off and it was time to check the pole lines. The plan was to leave the right hand line for at least two hours before checking it. Going over the micro pellet line again with double dead red maggot the float settled and soon shot under with another nice hybrid in the net. I took another four fish from this line before the need to top up with another ball of micro's. It was time to try the heavily fed line, again double red maggot and the float dipped straight away with a larger bream on the line of around 4lb. Happy days I thought, they've turned up in on the groundbait line. Well I couldn't be more wrong in my thinking and I spent the next hour picking up the odd roach from the right hand line but no more big bin lid bream. 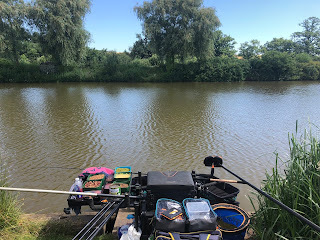 Very frustrated I had felt I'd lost my rhythm for the day so I decided to top up the right hand line with four more balls of groundbait and start to get some grounbait down the margin line. 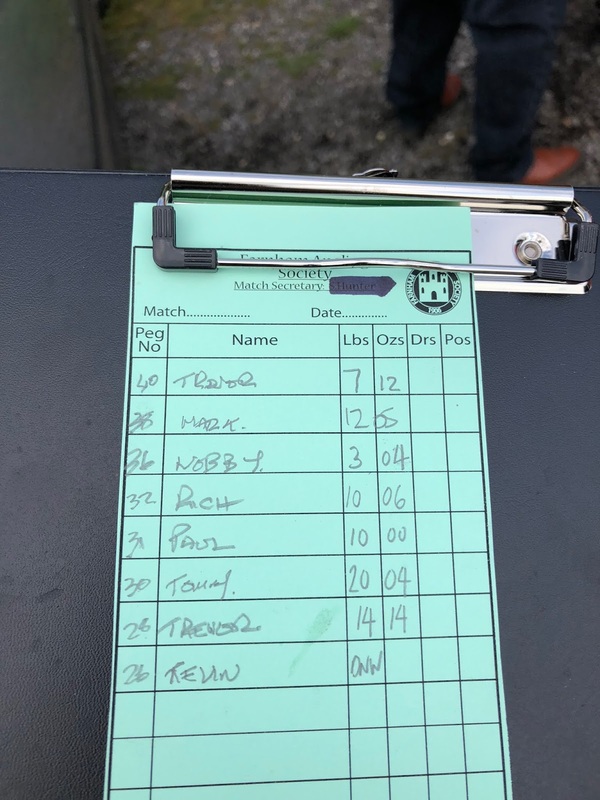 The caster line was producing some roach and perch. I had foul hooked something large which I suspect was a carp however after a few minutes the rig came back under the tip with nothing to show. The final hour to go I'd potted in a large amount of neat groundbait on the margin line however it kept on producing perch! 12lb 5oz for a lake 3rd. 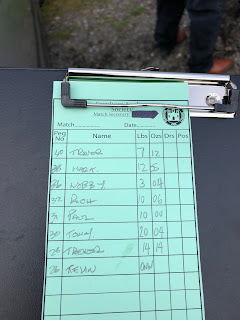 Well done to Tommy winning the match with 20lb 4oz and Trevor in the runners up position with 14lb 14oz. Interestingly no carp were caught today. A new venue and the negative, positive approach worked for me however was the large bream just a lucky one off? 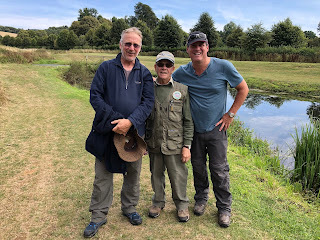 Well the weight in showed that a few anglers all had the odd larger fish to show for their efforts so maybe that was the case. The roach where biting most of the day until the bright sunshine knocked a damper on the sport. To retry the positive, negative approach I'm heading back to a different peg, further up the lake to see if I can get some good sport on the pole. Watch this page as I'll report on the session next week.